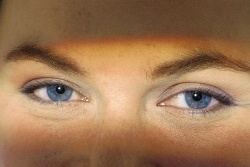 Do you like this site? Help us spread the word — link us to your site! 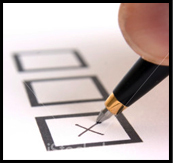 If you would like a link to your organization's web site from this site, please contact us with your URL for consideration. Instructions: Copy and paste the code below into your HTML document. 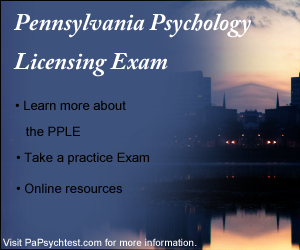 Prepare for the Pennsylvania Psychololgy Law Exam (PPLE) with information, links, and practice tests. Instructions: Copy this image to your server. Paste the code below into your HTML document. 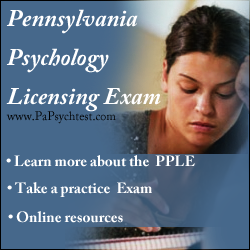 This site is an independent resource and is not affiliated with the State of Pennsylvania, Lasergrade, or PSI.